We were impressed with ActiveCampaign's functionality. 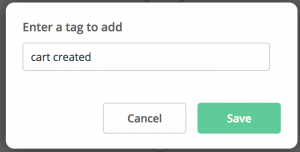 We found ways to use it with WooCommerce and created a plugin that adds your new customers from WooCommerce to Activecamapign and tag those customers. See more at Wordpress.org. Here are articles that help you make use of ActiveCampaign within your site. 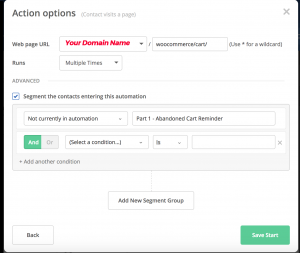 In this article I will discuss how you can create an Abandoned Cart Reminder process for your WordPress site using WooCommerce and ActiveCampaign to boost sales and encourage customer engagement. Thank you for visiting Amazon.com. You recently added items to your Shopping Cart. If you haven’t already purchased or removed them, simply visit your Shopping Cart to complete your order. 1. First and foremost, this process requires ActiveCampaign. If you are not using ActiveCampaign, you can click on this link to learn more about this email marketing and automation tool. 2. This process requires that the ActiveCampaign site tracking script be running on your website. The easiest way to add the tracking script to your website is to download and install the ActiveCampaign WordPress plugin from the WordPress repository. 1. Send an email to contacts with link to site, product or shop. This step is important. When the ActiveCampaign WordPress plugin is installed and activated on your site, you can track a contact’s travels around your site. When you send an email to a contact that contains a link to your site, that link is coded with the contact’s information so that the contact’s activity on your site can be properly tracked. All your contact’s page visits are then recorded in ActiveCampaign. Please note: Activity can only be tracked of known contacts. 2. Contact adds a product to the shopping cart and visits the WooCommerce Cart page (/cart/); contact tagged with [cart created]. The tracking script detects that the contact has visited /cart/ which will trigger an automation that tags the contact with the tag [cart created]. 3a. Contact proceeds to the checkout page (/checkout/order-received/*) and completes the product purchase; remove [cart created] tag. If the contact makes a purchase, we can remove the [cart created] tag. Since the contact made a purchase, we don’t want to send them a reminder to check their cart. 3b. Contact leaves site – abandons the product in the cart. The contact gets distracted and leaves your site without making a purchase, the contact remains tagged with [cart created]. 4. Wait specified amount of time; if contact still has tag [cart created], send the email reminder. Setting the wait time interval is up to you. The time period can be as short as an hour or as long as 24 hours. It is entirely up to you. Once the time has elapsed, the automation will send a reminder email to the contact. Using ActiveCampaign, the process requires two automations. Each automation begins when a contact visits a page on your site. The first automation, Part 1, is needed to identify the contacts that add a product to their shopping cart. Any contact that adds a product to their shopping cart and visits [YourWebsite]/cart/ gets tagged with [cart created]. 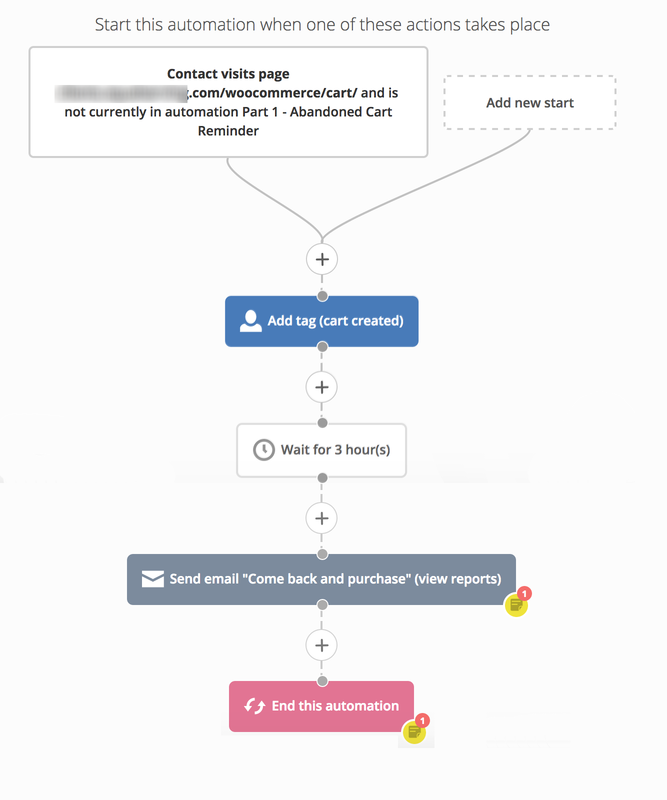 The second automation, Part 2, removes the tag [cart created] if a purchase is made when the contact visits [YourWebsite]/checkout/order-received/*. Notice the asterisk in the URL. This is important. When a purchase is made in WooCommerce the contact or customer is redirected to a page with an address like [YourWebsite]/checkout/order-received/[Order Number]/?key=wc_order_9999aa99a9999. For our purposes, we don’t need to know what comes after/order-received/. So, we use a wildcard (*) to accept anything. 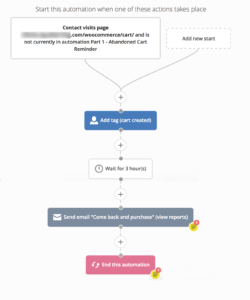 The first diagram on the left below illustrates the process flow, including the campaign that triggers the initial email addressed to your contact, the interactions your contact has with your website and the logic of the two necessary automations. It may seem complicated but once you understand the steps it is quite simple. Click on the image to see the full size image. 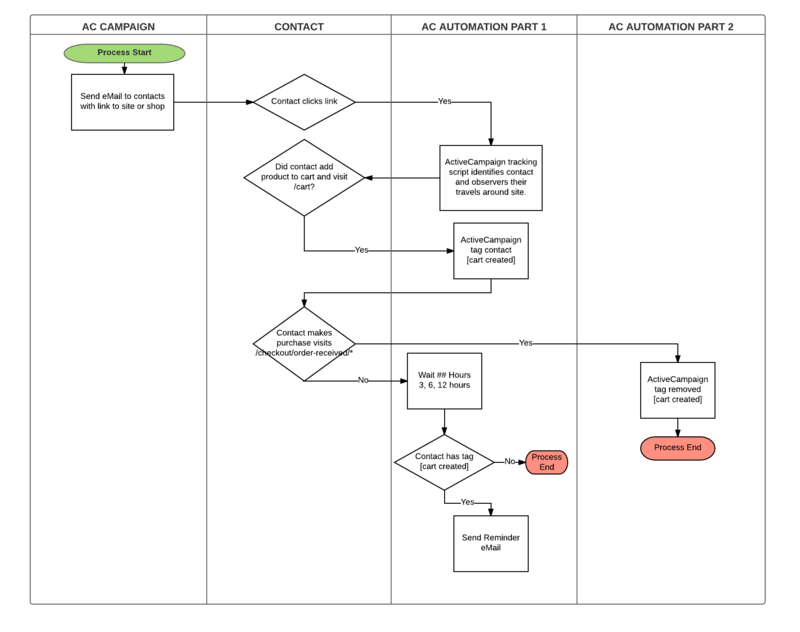 The second and third diagrams are screenshots of the ActiveCampaign automations. These will serve as guides for you while creating your automation within your account. Step 1: Open ActiveCampaign and create a new Automation. 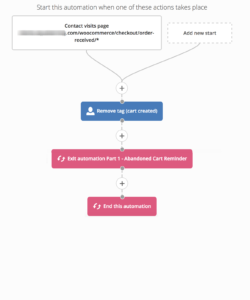 Step 2: Select Start From Scratch automation and name it Part 1 – Abandoned Cart Reminder. 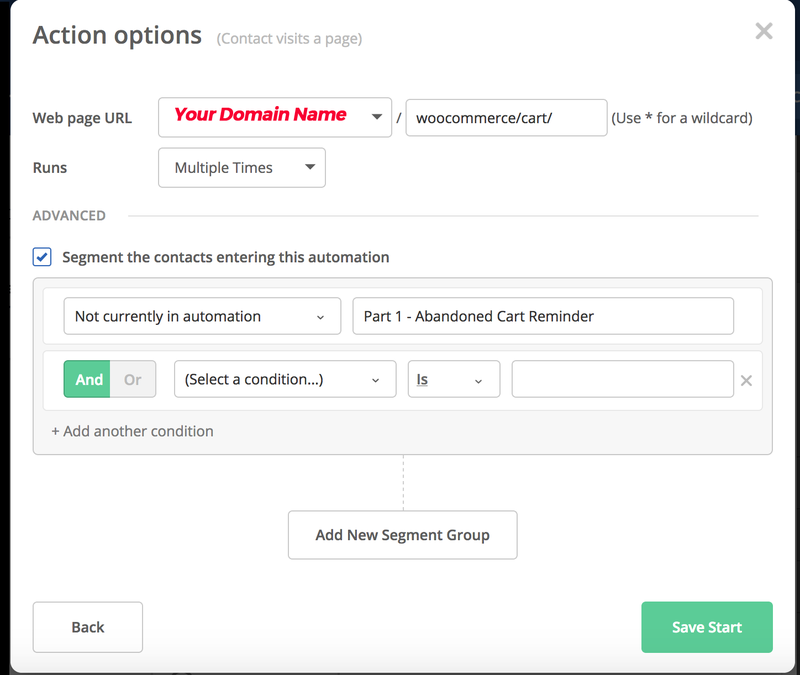 In the Action Options section, enter the website domain and the path to your WooCommerce cart usually /cart/. Check the Segment the contacts entering this automation. Select Not currently in automation and select this automation that you are working on Part 1 – Abandoned Cart Reminder. Use the screenshot as a guide. 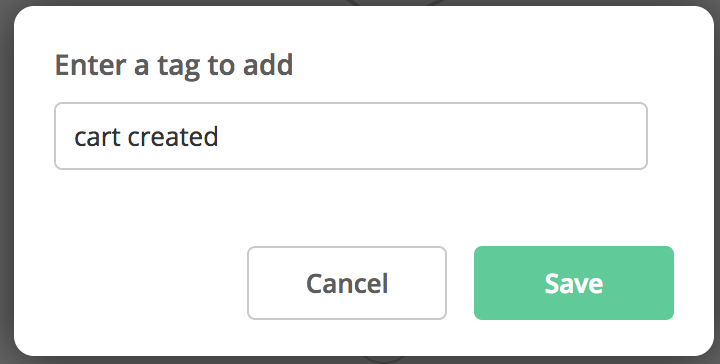 Click the plus sign to add a new action. Click on Contacts in the left column and then click on Add tag. On the next popup, Enter a tag to add, enter [cart created] without the brackets. Use the screenshot as a guide. 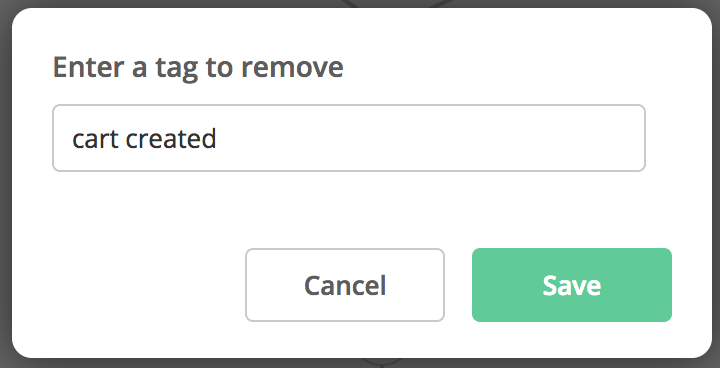 Click the plus sign to add a new action. Select Conditions and Workflow from the left column and choose Wait. Select For a specified period of time and then enter the time period you want to wait. Tip: While testing, you might want to use just a few minutes (10 or 15 minutes). You don’t have any emails to send. You can create an email to get started. 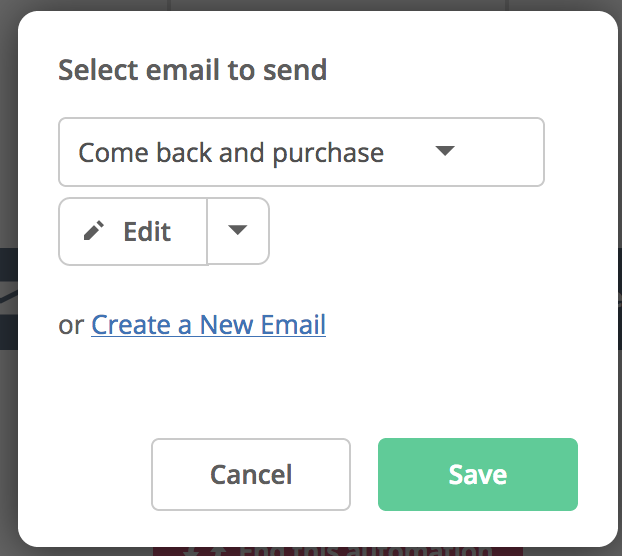 Click on the “create an email” to create the email that you would like to send to your returning customer. Use the screenshot as a guide. Click the plus sign to add a new action. 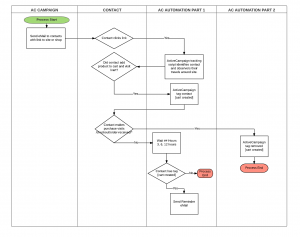 Select Conditions and Workflow from the left column and choose End this automation. Step 8: Create a new Automation. Step 9: Select Start From Scratch automation and name it Part 2 – Abandoned Cart Reminder. In the Action Options section, enter the website domain and the path to your WooCommerce cart usually “/checkout/order-received/*” Please ensure that you enter the asterisk in the URL as shown here. Use the screenshot as a guide. Click the plus sign to add a new action. Click on Contacts in the left column and then click on Remove tag. 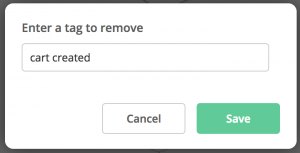 On the next popup, Enter a tag to remove, enter [cart created] without the brackets. Use the screenshot as a guide. Click the plus sign to add a new action. Select Conditions and Workflow from the left column and choose End other automation and select “Part 1 – Abandoned Cart Reminder” to remove the contact from Part 1. This step is necessary since the contact made a purchase there is no need to keep them queued in the automation to send the reminder email. Tip: While testing, you might want to use just a few minutes (10 or 15 minutes). Create an email campaign that includes a link to your new product or service or just a link to your site. I hope this article helped explain how you can add an Abandoned Cart Reminder to your business process using ActiveCampaign and WooCommerce.